It’s been several weeks since my last blog article, but it’s not due to a lack of photography. Since my last article in mid-May, I photographed wildlife at a few locations in northern Florida and here in northern Virginia. I am very behind in image processing and posting blog articles. I hope to catch up over the next couple weeks. Of all the images that I have taken recently, the ones in this article may not be the most favored, since most people have a strong dislike of insects. I too am not a big fan of insects, especially the ones that often bite me when outdoors, but I do find them interesting. 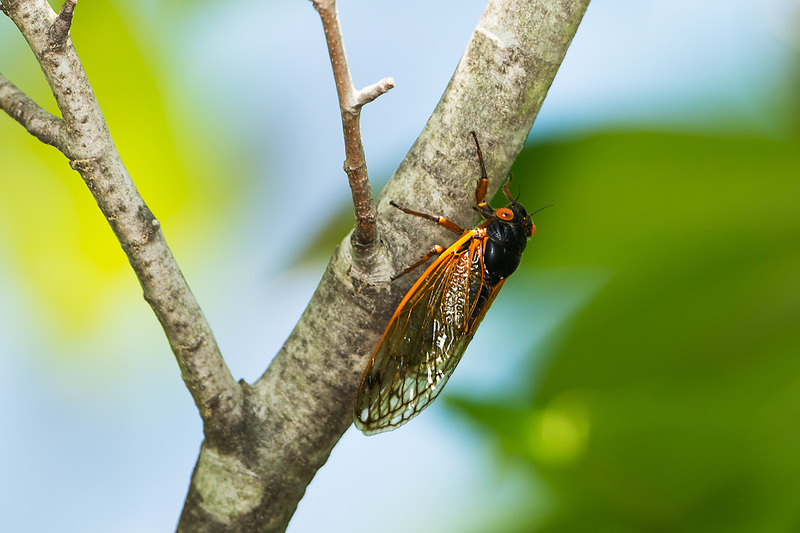 Of particular interest are cicadas because of their unusual life cycle, size, and sounds they produce. 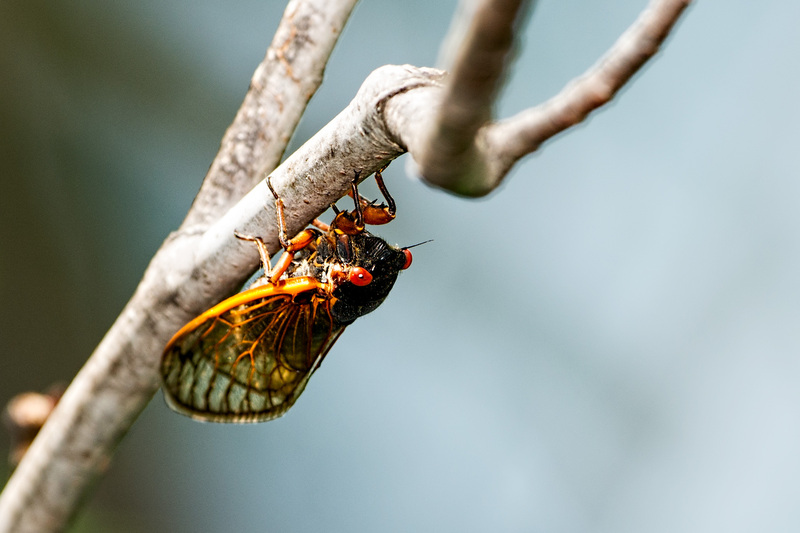 If you do not live in the mid-Atlantic area, you may not have experienced the recent onslaught of many millions and millions of cicadas that have carpeted the area. They appeared several weeks ago as nymphs emerging from the ground, where they have lived for the last 17 years, since 1996. Shortly after leaving the ground, they shed there exoskeleton and morph into large flying adults to mate, lay eggs, and die, all within about a four week period. 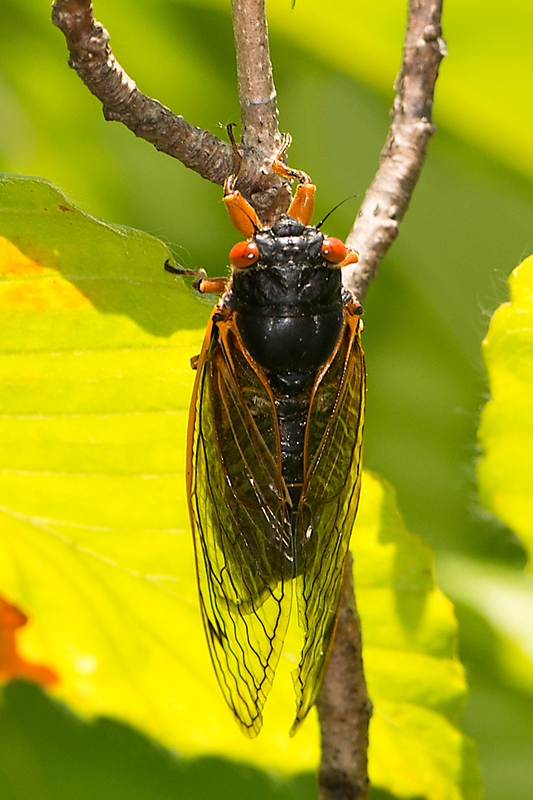 There are several thousand species of cicadas worldwide and not all have a 17 year lifecycle. The ones we experience here are known as Magicicadas. As you can see in the images in this article, photographed around my home, the adults are colorful with small beady red eyes, colorful bodies, and large clear wings. The males make a loud humming sound to attract the females, and for a couple weeks, the sound was so loud I could here them indoors through closed double pane windows. 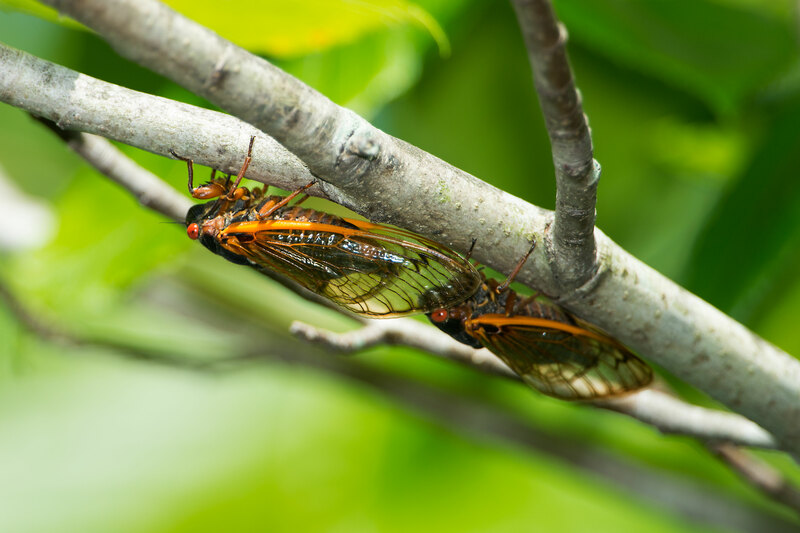 After mating, the female cicadas cut slits in young tree branches and deposit hundreds of eggs. When the eggs hatch, the nymphs drop to the ground, where they burrow down and live for 17 years living off the sap in tree roots. Even though you may not like insects and do not find cicadas interesting, I highly recommend this video by Samuel Orr as part of a kickstarter project. Today, as I write this, I hardly hear a cicada and have to look hard in the trees to find one that is alive. There are a lot of dead ones on the ground, making good food for other creatures. Although they are more a nuisance than anything else, I am glad that they will not be back for 17 years, and by then, I expect to be living someplace other than Virginia. Tomorrow, I will go back to processing images other than those of insects. As you mentioned, not many people are fond of insects. I am one of them, rather I am paranoid around insects, to be honest. However, the way you portray the cicadas with fantastic photos, wonderful writing, and beautiful music and video.. the sounds of millions cicadas are now music to my ear. I am ready for the fat lady to sing as far as the cicadas are concerned. It is a fascinating quirk of nature and you have provided us with a great look at their strange life cycle. I also happen to know you used a strange “macro” lens to capture these colorful, but strange little creatures. Great work as usual! Hi Stephen ..great images. This insect has such a fascinating story – a mystery of nature. I too am not a big bug fan. Although I believe in the beauty of nature in all forms. Thanks for posting these images and the video. Our national news station up here in Canada did a wonderful story on these Cicadas and their story. Great photos of an interesting yet ugly insect. I personally hate all insects, this one included. They haven’t appeared yet here on Long Island as the weather really hasn’t warmed up. Not looking forward to their arrival either. An entertaining and enlightening post, as always! Great article and shots… and I already miss their alien drone sounds waking me in the house during the early morning hours :)) Keep the great blogs/images coming and I look forward to your processing the Florida shots.